So a skincare launch is a skincare launch is a skincare launch, right? Well, not when the person behind it is a woman like Maleka Datta. If you don’t immediately recognise her name, you will recognise the brands that she’s worked with. Part of the team that grew Clinique to #1 in the UK, she also headed up Origins in the UK and Ireland before moving to Lancôme to oversee one of the brand’s biggest ever launches, Genefique. After 30 years living the dream, she realised that actually, she wasn’t. An entrepreneurial streak runs in the family – her Dad always wanted to go out on his own, but never quite got there. Though if he had, he knew what he’d call his brand: Merumaya combines the first two letters of every family member’s name, so by using it, that particular dream has also come to life. When Maleka talks me through her range I am genuinely excited. The ‘Integrative Effective Skincare’ approach combines the best that nature has to offer with the most scientifically proven ingredients, to fight further aging while reducing the existing signs. The products are packed with powerful active ingredients in anti-blemish formulas: they sound exactly the answer to my current skincare woes. Currently the range includes cleansers, a moisturiser, eye-cream, face mask and peel, along with a manual cleansing brush and daily cleansing cloths (which are heavier than muslin to retain the warmth of the water, but lighter than a traditional face cloth). Everything feels high-end and luxurious, with melty, sensorial textures and the gorgeous Merumaya trademark scent. The cleansing balm particularly interests me: I think I may finally have a contender for Liz Earle’s place on my bathroom shelf. Pricewise, I am in for a pleasant surprise. Nothing is more expensive than €43.50 (that’s for the serum, and the sterling/euro conversion is fair and decent, too). Maleka is saving costs on advertising (there isn’t any), on packaging (simple, hygienic and effective), and by taking an initial hit to her bottom line. It surprises me how much I’ve enjoyed the meeting. At one stage, Maleka is talking about the importance of feeling good as well as looking it. “You know when you see a woman who’s 100% confident in herself and what she’s doing, and it’s so attractive - it draws people in?” I think anyone who’s ever met her will know exactly what she means. 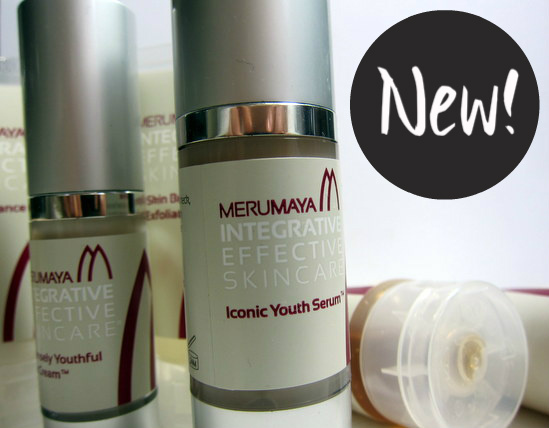 Merumaya Integrative Effective Skincare launches in Arnotts in February. I’ve just started my regime so watch this space for my reviews in a few weeks’ time! So cool you got to meet her she sounds like an inspiring woman! Wow! Great pedigree behind the brand. Oh I do love a good face mask. Will definitely have to check this range out, sounds luxurious and without needing to break the bank! Wow - great post. I have never heard of this name before but my favourite skin care brand is probably Lancôme so I'm definitely interested. Definitely keep an eye out on the products when they launch! Reviews will follow, but first impressions are very, very good. Holy cow! Your new blog design looks amazing! Bravo! It sounds like a great collection and we can't wait to hear more reviews! p.s. I just came to the site (have kept up on the reader) and love the new look! I absolutely love your new layout and design!! Beautiful! Hi dear, love love your new blog design, it looks so chic and savvy! Well done! Great post! Thanks for the follow, I am following you back on Bloglovin. Come by any time! Delighted you like the new design - thanks lovelies! Thanks for introducing this exciting brand. Beautiful products! sounds like a good product! i'm using kiehls now and loving it - also that clarisonic thing! Very cool - can't wait to try out her new line!